A sudden downturn in a dog's health can leave an owner feeling quite helpless and searching for answers to all kinds of dog health questions. When your canine companion isn't feeling one hundred percent, study the symptoms to help figure out what's wrong with your dog. Nothing takes the place of a good vet, but if you find that your dog becomes ill during emergency hours, or you're wondering what could be wrong, this widget featuring a list of dog symptoms can help. 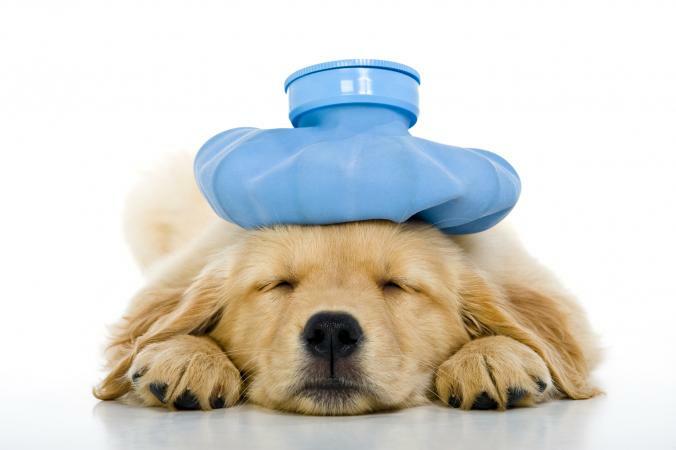 Click on the primary symptom your dog is experiencing. Next, you'll get a list of secondary symptoms to choose from. Once you get to the secondary list, you can click on your dog's next most prominent symptom to get a list of possible causes. What Does It Mean If My Dog Is Breathing Fast? What Causes White Dog Poo? If your dog is experiencing two or more symptoms of concern, you can also use this widget as a multiple symptom checker. Make a list of your dog's symptoms and then check each symptom using the widget, writing down the possible causes for each. Once you've checked them all, review your list to look for matches. While many diseases can have multiple symptoms in common with other diseases, you should be able to narrow down a smaller list of possible underlying causes for your dog's condition. Fever, lethargy, vomiting, foul-smelling feces and bloody diarrhea together indicate your dog may have parvovirus. This is a potentially deadly condition that requires treatment right away. Shaking can indicate your dog is having seizures, has been poisoned or possibly even kidney disease. Lethargy is a symptom that can indicate many conditions and needs to be viewed in combination with other symptoms. A lethargic dog could have heartworm disease, heart failure, diabetes or any number of other serious problems. It could also indicate a behavioral problem such as anxiety and depression. Poor appetite or refusal to eat altogether is also a symptom that can indicate several health problems. These can include anxiety, mild indigestion, dental disease, or thyroid disease. If your dog refuses 3 or more meals or has not eaten in 36 to 48 hours, contact your vet immediately. If your dog is in pain, you will see a collection of symptoms that including vocalizations like whimpering and crying, lack of appetite, restlessness, shaking, and behavior changes that could include aggression. The dog may also show difficult getting up and moving around. Take your dog to the veterinarian immediately to determine whether the dog has a physical injury or if the pain is an indication of an internal medical condition. While an expert online can offer opinions, only a veterinarian who examines your dog in person can positively identify what's wrong with your dog. No published list of dog symptoms can cover every type of dog health problem or issue, nor can it provide a definitive diagnosis. If your pet becomes sick, aggressive or acts abnormally, you should seek medical attention immediately and follow your vet's instructions for treating your sick dog.